This study estimates the global market of melamine formaldehyde for 2014 and projects its demand for 2019. Also, the market research study gives data for the global market both qualitatively and quantitatively. 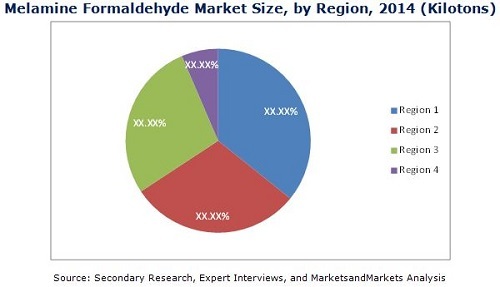 In the report, the competitive scenarios of the top players in the global melamine formaldehyde market market have been discussed in detail. The report has profiled the leading players in this market with their recent developments and other strategic industry-related activities. The key players operating in this market include BASF SE (Germany), Borealis AG (Austria), Mitsui Chemicals (Japan), Chimica Pomponesco S.p.A (Italy), Allnex Belgium S.A. (Belgium), Chemplastica SpA (Italy), INEOS Melamines GmbH (Germany), Eurotecnica Contractors and Engineers S.p.A (Greece), Qatar Melamine Company (Doha), and Hexza Corporation Berhad (Malaysia), among others. The global market, along with its applications, showed a high growth in the past few years and is estimated to continue the same growth in coming years. An increase in demand in end- use industries such as automotive, packaging, building & construction, and other applications are the key influencing factors for the global market. Currently, the Asia-Pacific region is the largest consumer of melamine formaldehyde and is estimated to grow at the highest CAGR. The countries such as China, Japan, and India are expected to lead the Asia-Pacific melamine formaldehyde market, with China having the largest share in the regional volumetric consumption of melamine formaldehyde. The market volume of melamine formaldehyde is second highest in Europe, after Asia-Pacific. Melamine based coatings are used to enhance the aesthetics and durability of wood. Also, its molding compounds make the surface durable and have characteristics such as hardness, heat resistance, and chemical resistance, which make it suitable for manufacturing wiring devices, and serving trays. The primary raw material of melamine formaldehyde has more thermal resistance that enables melamine formaldehyde to have characteristics such as more chemical resistance, adhesion strength, wettability, and others. North America and Europe are the most active markets in terms of strategic initiatives, owing to their market demand. The laminates application has led to rapid growth in the melamine formaldehyde market. The significant melamine formaldehyde manufacturers include Hexza Corporation Berhad (Malaysia), INEOS Melamines GmbH (Germany), Qatar Melamine Company (Doha), Chemplastica SpA (Italy), Eurotecnica Contractors and Engineers S.p.A. (Greece), BASF SE (Germany). This report covers the melamine formaldehyde market by key regions as well as important countries in each of these regions. It also provides a detailed segmentation of the market on the basis of their key applications upto 2019. *Details on Business Overview, Key Financials, Product and Service Offerings Related Developments and MnM View Might Not Be Captured in Case of Unlisted Companies.